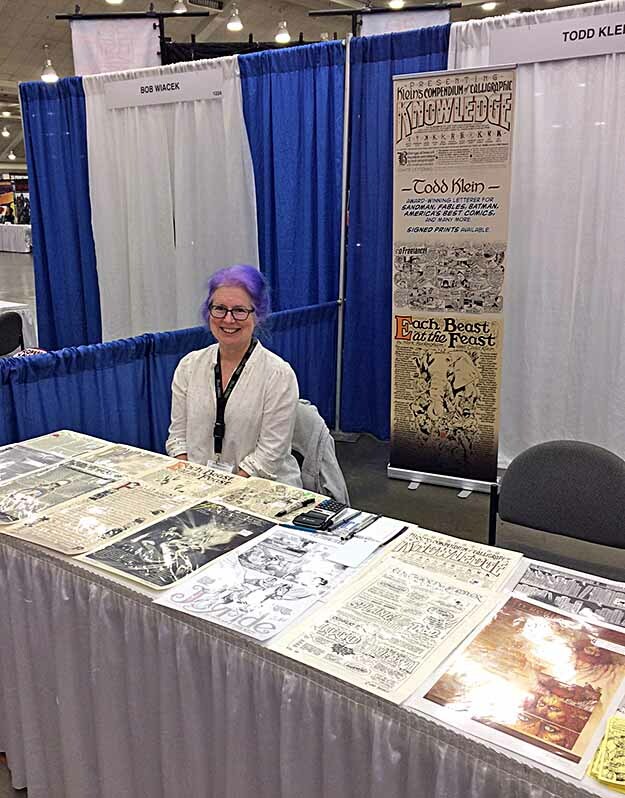 Another great Baltimore Con has come and gone, and here’s my report. Baltimore is about a three hour drive from my home in southern New Jersey. I left the house at 8:30, and was at the hotel about 11:30. My room wasn’t ready, so I checked my suitcase and walked over to the convention center with my stuff to set up. Last year I had a cart to wheel it in, this year I brought less, so I decided I could carry it all without the cart. I could, but it sure got heavy by the time I reached my table! If I do this next year, I’m going back to the cart. I met my booth assistant Andrea Bergner in the convention center, and we picked up our pro badges. Last year I advertised for help at my booth on Facebook, and Andrea was one of two people who volunteered. She did such a good job that, when she offered to help again this year, I jumped at the chance, and she was with me all three days. Andrea is an excellent salesperson, and good company. Our booth was not on a corner this year, so my prints were a little crowded, but we did fine with the space we had. My banner made its second appearance. 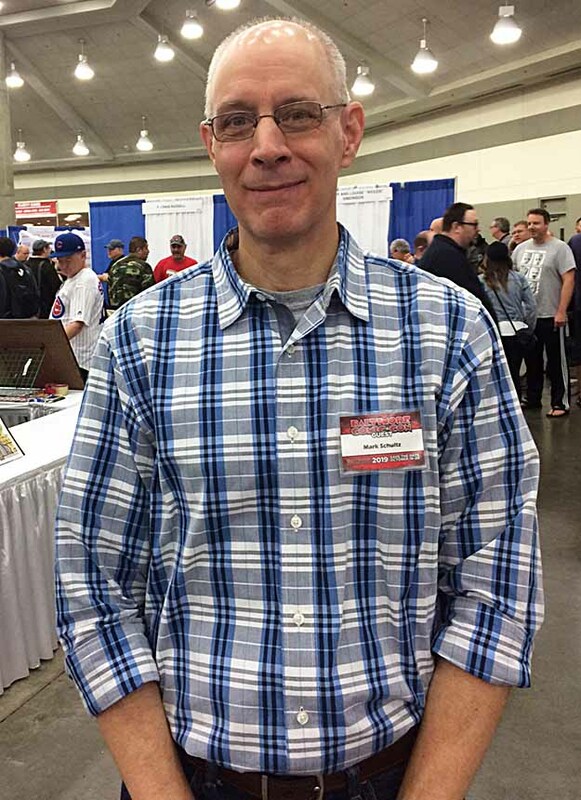 As happened last year, John and Cathy Workman were in the booth directly behind me, and on either side of me were legendary inkers Bob Wiacek and Tom Palmer, who were good neighbors. In addition to selling prints and such, I take commissions at the booth for sketchbook title pages like this one. The owner plans to fill it with comics characters who wear trench coats. You wouldn’t think there would be that many, but he has a list of about sixty! 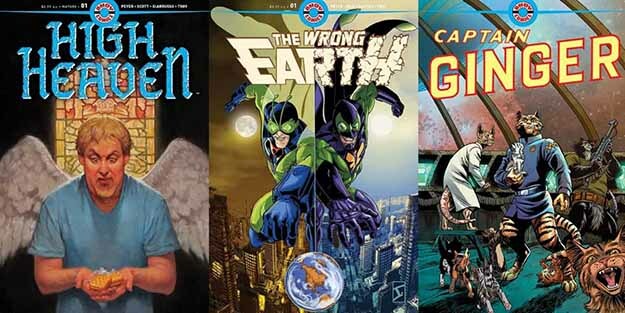 The title comes from Neil Gaiman’s original BOOKS OF MAGIC miniseries. 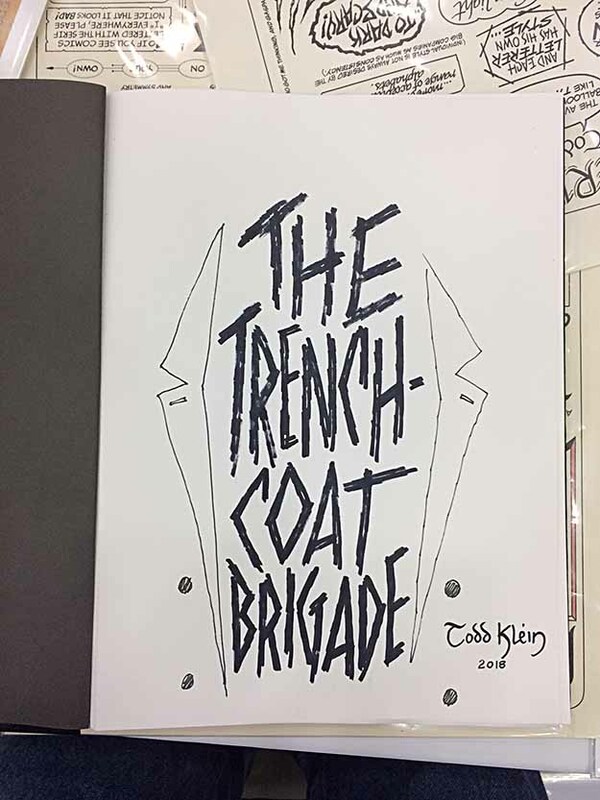 The sketchbook owner wanted me to draw a man in a trench coat, but I don’t draw people, so we settled on this idea, and he was quite happy with it. I try to remember to take photos of the people I talk to at shows, but I’m getting worse at that. 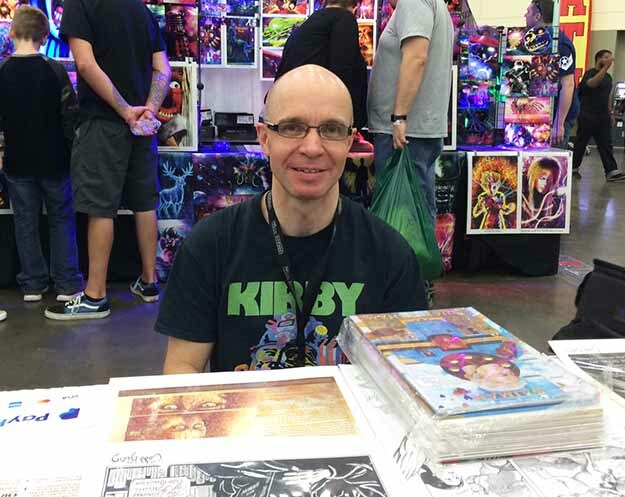 I did get one of inker John Beatty, who I worked with for some years on Batman comics. I hadn’t seen him in a long time, and it was good to catch up. Others I talked to Friday were Mike Manley, Richard Case, Jerry Ordway, and more I’m probably forgetting. The Friday hours are 1 PM to 7 PM, and as usual it was the least crowded day. Many people brought comics and books for me to sign, which I’m happy to do as long as it’s one issue of each. The theme I heard was, they wanted to get their signings out of the way first, then put them away and enjoy the con. I’ve never been a fan of comics with signatures on the covers, but I do like the idea of hardcover and trade paperback collections being signed, and I have a few of those myself. Friday evening Andrea and I had dinner with John and Cathy Workman and their friend John, who lives in Baltimore. We had a good time talking about comics, old movies, and other things at Johnny Rockets, near the Hyatt. 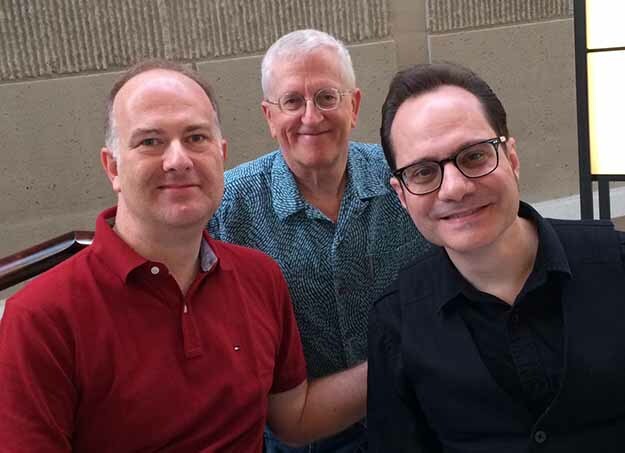 Saturday morning I had breakfast with artist/writer Mark Buckingham and inker Andrew Pepoy along with Andrew’s friend Jen, a sort of mini FABLES reunion. 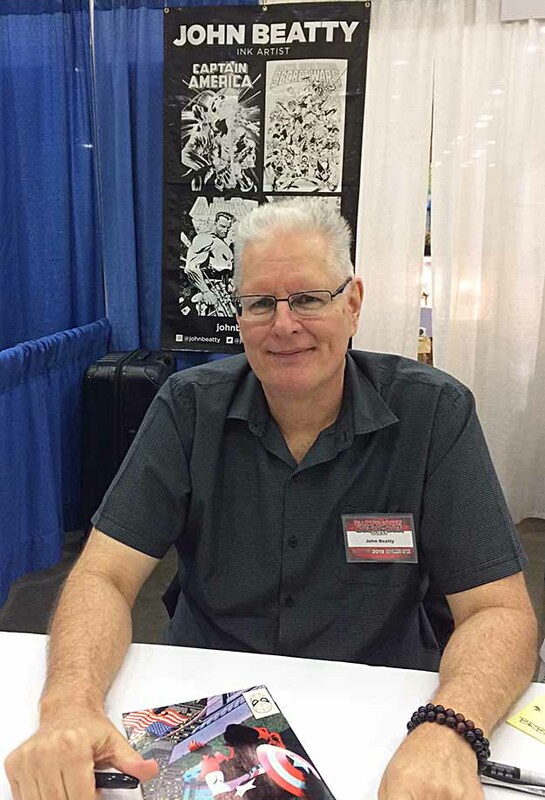 It was a chance to talk over upcoming projects like MIRACLEMAN, which Bucky is now co-writing and drawing, and which I should start working on again in a few months. Saturday was the busiest and longest day in the Exhibition Hall. I was happy to see my friend Henrik Andreasen at my table with plenty of things to sign. Henrik lives in Denmark, and has been attending U.S. cons since at least 1993, where we first met at the San Diego Comic-Con. He must have a massive collection of signed comics and books by now. It’s always good to see him and chat with him. Another kind of commission I do at my table is adding dialogue balloons to sketches. 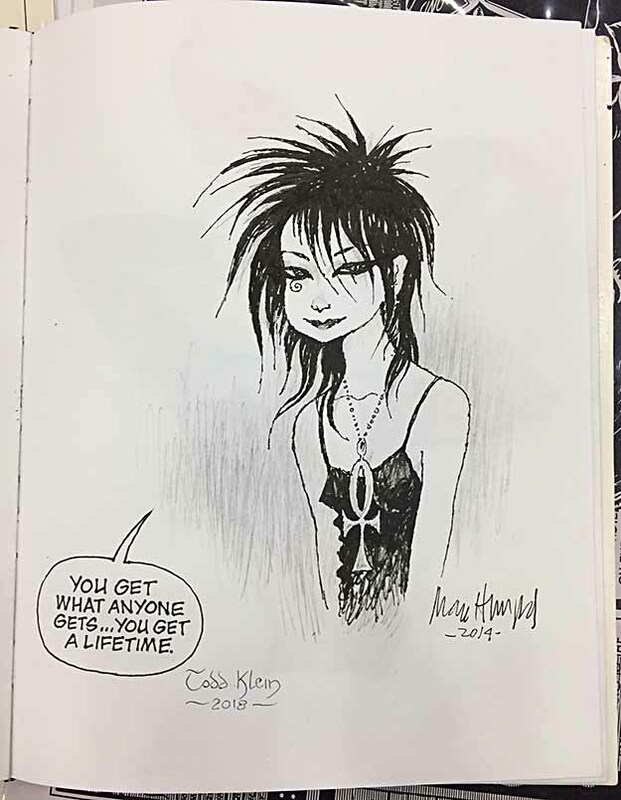 This one gave me a chance to collaborate with SANDMAN artist Marc Hempel again for the first time in a while, though there were four years between his sketch and my addition. The words are, of course, by Neil Gaiman. 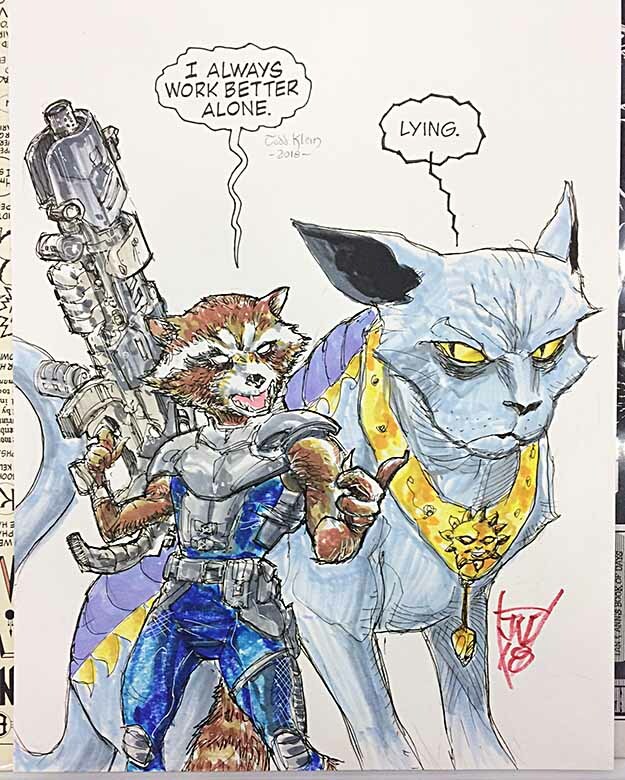 Here’s another one of those, a fun mash-up of Marvel’s Rocket Raccoon and Lying Cat from SAGA by Brian K. Vaughan and Fiona Staples. I’m afraid I don’t know who did the art, but I like it. This was a first, a double sketchbook title commission that I enjoyed doing. I don’t do this sort of thing at home, I’m too busy with other work, but as I’m sitting at my table for hours at a con, it’s fun there and passes the time. 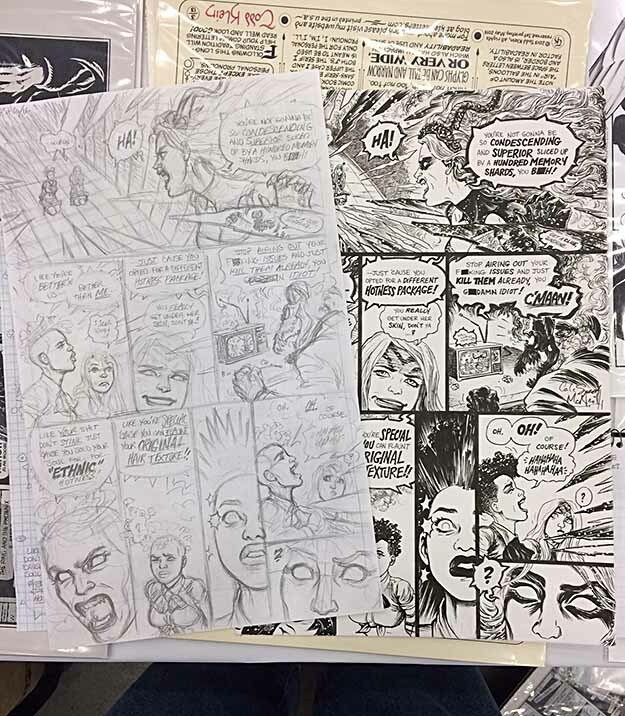 Writer/artist Carla Speed McNeil of FINDER fame stopped by at my booth and gave me an amazing gift: a page of her original art from EMPOWERED, a comic she’s doing for Dark Horse with Adam Warren, as well as her original layout and her lettering layout (not shown). 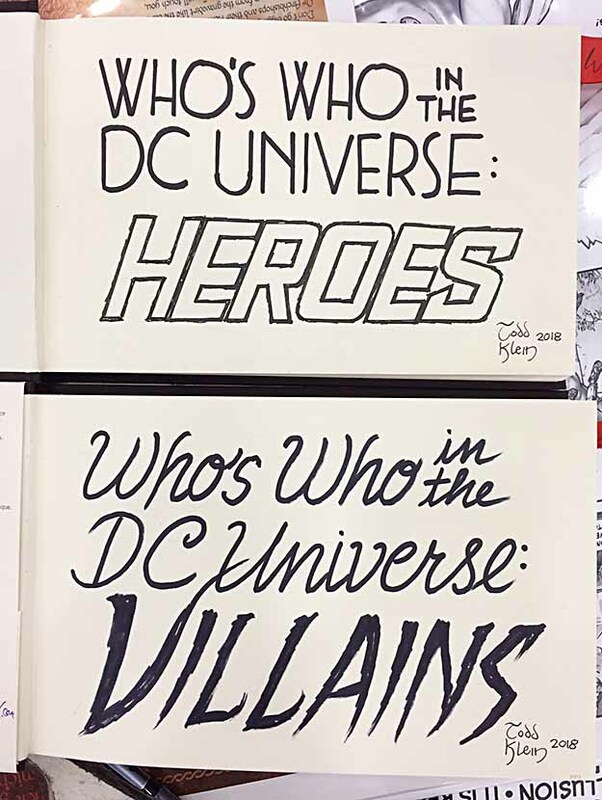 I was appreciative and delighted, as it will make a good blog post about her lettering and art process, one I hope to get to soon, and the art is terrific! Thanks again, Carla! 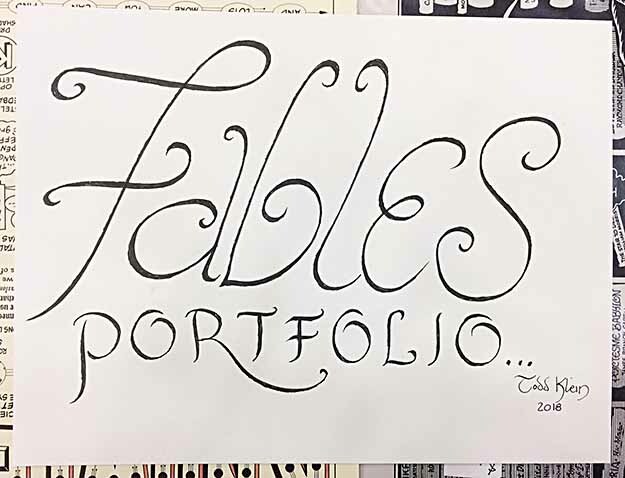 One last commission for a FABLES portfolio title page, and perhaps my favorite of the con. I actually did it twice. On the back of this paper is another version, but the marker I used turned out to be very smeary, and before long it was a mess, so I redid it with a waterproof Sharpie. Saturday afternoon I was on a panel for new company Ahoy Comics along with editor-in-chief Tom Peyer, writer Stuart Moore, and artists Jamal Igle, June Brigman and Roy Richardson. My involvement is doing the cover logos and the company symbol. The panel was entertaining, I thought, and the books that are out so far, the first two above, look good! Saturday evening was the ‘Ringo Awards at the Hyatt. 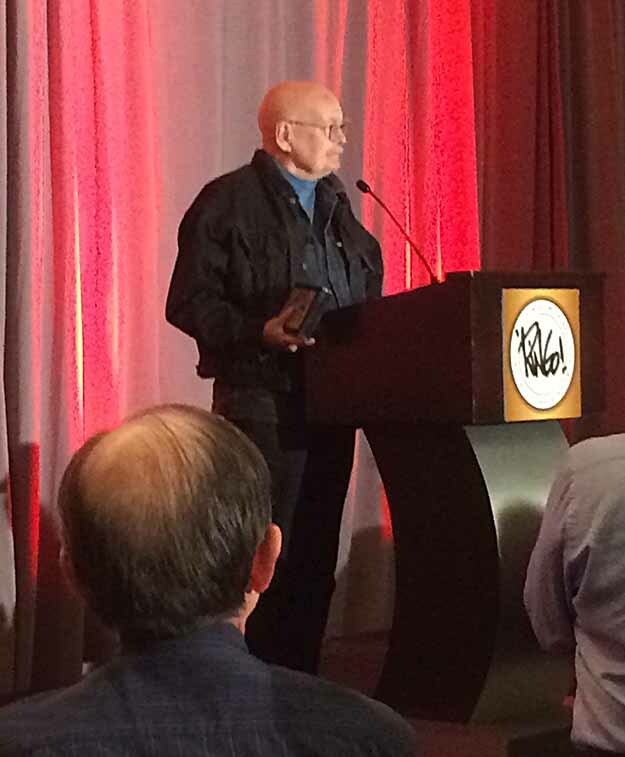 I only have this one photo, of Lifetime Achievement Award winner Dennis O’Neil, a friend and co-worker from my time on staff at DC, and my editor on Batman books for many years. The awards were fun, though long, but preceded by a fine dinner, and they gave me a chance to say hi to more old friends. 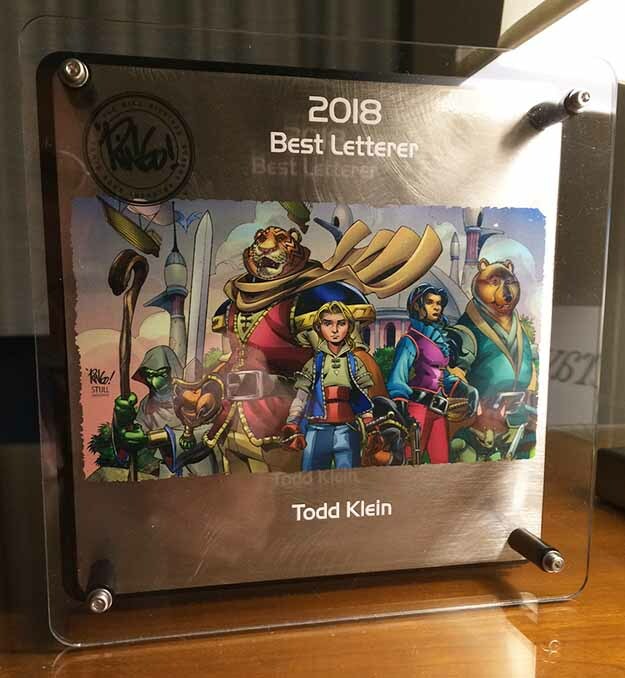 I won the award for Best Letterer for the second year in a row (this is the second year of the awards), even though I was hoping it would go to fellow nominee and friend John Workman. John is the person who got me started with lettering at DC when we were both on staff there in 1977, and is highly deserving of an award. Let’s try and get him on the podium in the near future! John has been given a few Harvey Awards, which this new award replaced at the Baltimore Comic-Con last year. The Harveys are now at the New York Comic-Con. Sunday I was at my booth from 10 AM to 2 PM. 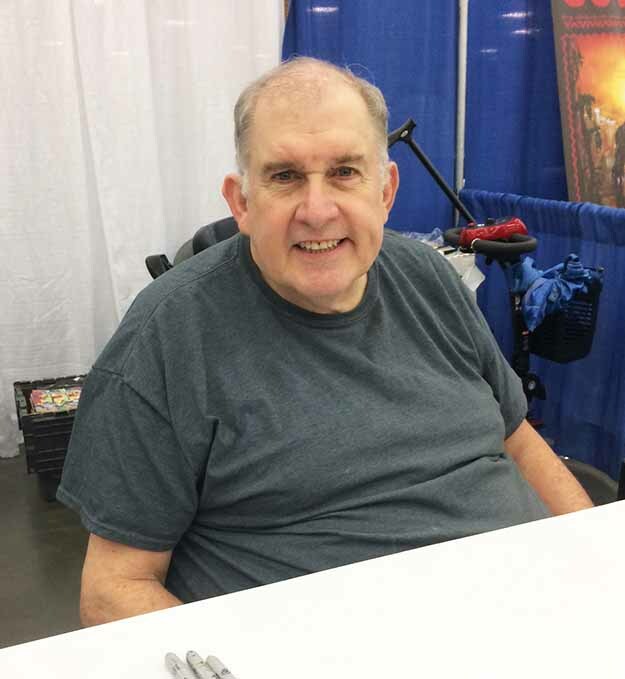 It was somewhat less busy, and I did get out to talk to other friends, including Mike W. Barr, above, who I worked with as a Batman writer and as an editor at DC. The other person I remembered to take a photo of is Mark Schultz of XENOZOIC TALES fame, who told me he’s working on a new one of those. I look forward to it. 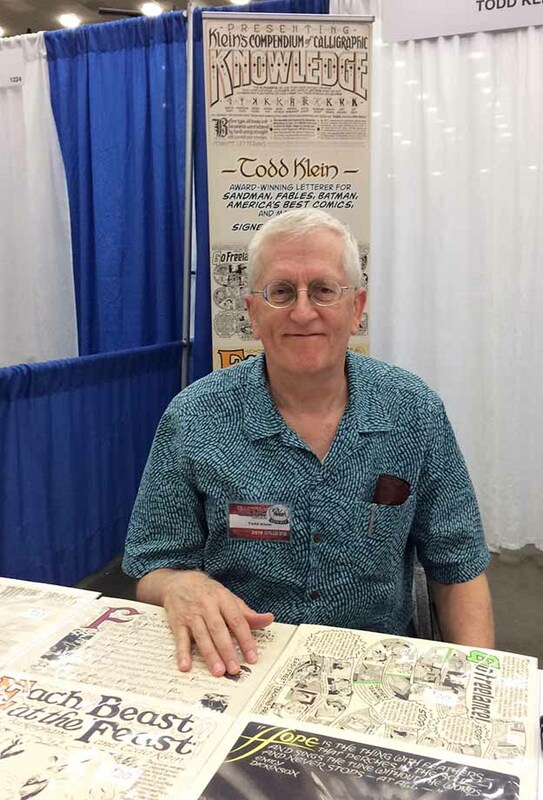 I also talked to Don Rosa, P. Craig Russell, Howard Chaykin, Steve Conley, Todd DeZago, Mike Gold, Mark Wheatley, Bob McLeod, Thom Zahler, Joe and Hilary Staton, and probably others I’m forgetting. It was a good time, and as happened last year, I did quite well with print sales, making it a win all around. Not sure yet if I’ll be there next year, but if so, perhaps I’ll see some of you there!